A few lines below this sentence you will see a painting. In the original it is a big painting, 80 x 70 inches, a little short of seven feet tall. It is in the collection of the Stedelijk Museum in Amsterdam. It was painted by Willem de Kooning (1904-1997) in 1963, 55 years ago. He died on 19 March 1997, 21 years ago. A couple of nearish anniversaries. If you do not know the painting, just look at the reproduction below and see what you think. If, on the other hand, you do know the painting, try and unknow it – strip your mind of all the associations of title and any accounts of its creation you may have read. That's impossible, but worth a try, as René Descartes would tell you. And then answer the question: What does this painting mean? When you finally want to be put out of your misery, scroll down a bit to get to the title and some thoughts that were provoked by this painting. Without the title the painting 'means' nothing. How can it be otherwise? The bright, vigorous colours may awake some feelings in you, but if you are honest, although you may feel some disconnected emotion, you would be hard-pressed to give the image any further meaning. Rosy-Fingered Dawn at Louse Point. The Homeric epithet/formula 'rosy-fingered dawn' needs no explanation to our readers, who dip their toast soldiers into their breakfast eggs with their right hands whilst holding von der Mühll's always sound Teubner 1984 edition of the Odyssey in their left hands. 486 pages of solid scholarship – the limp-wristed will use a bookrest. There will also be a slightly coffee-foxed Liddell and Scott and – of course – Marzullo's indispensable concordance within easy reach. More toast, please – and that excellent quince jelly! Dyspepsia (δύσπεπτος) alert: The late Martin West's recent effort at an Odyssey text (Teubner, 2017) should be given a wide berth – it will leave you confused and fretting: the stabilising effect of that bottle of Heidsieck with which you washed down your toast soldiers will be quite wasted. Nothing sets you up better for the journey on the loud-thundering bus through the rosy-fingered dawn than reading a passage of Homer with your breakfast. You have already assigned epithets to all your colleagues in the call-centre – 'chair-bending Kaylee', for example – but wisely keep these to yourself. On the bus you will surely reflect that the formula ῥοδοδάκτυλος Ἠώς, [hrododaktylos Eos – 'rose-fingered dawn'] occurs twenty-two times in the Odyssey, five times in Book IX alone, the book containing Odysseus' tale to Lord Alcinous of his many great adventures after his parting from the goddess Calypso – the buccaneering raid on the Cicones, the encounter with the Lotus Eaters, the brutish Cyclops, his many nights of terror at sea and on land and five rosy-fingered Hellenic dawns. However, given the scholarship you try to wear so lightly at the call-centre, what to make of its replacement by a few splats of yellow and pink? This problem demands further investigation. Louse Point is at the eastern end of Long Island, New York. It is not the most eastern point: it looks out north-east over Napeague Bay, rather than the trackless wastes of the North Atlantic. Good enough for artists. 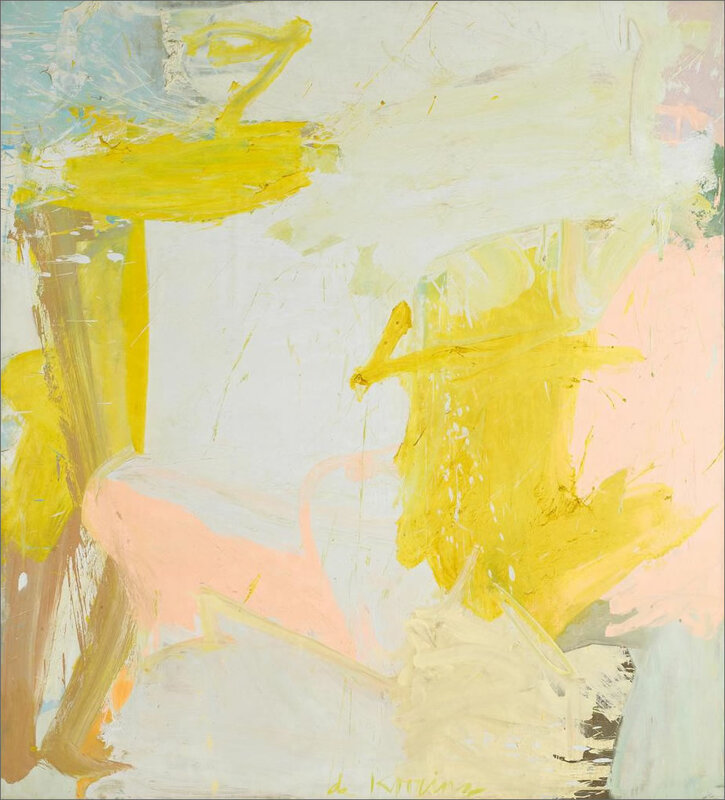 It was in 1963, the year of this painting, that de Kooning moved from his New York studio to a small house in East Hampton on the eastern shore of Long Island, only about 5 km away from Louse Point. Perhaps de Kooning's large canvas was an homage to his new home. Who knows? That is all the backstory to the painting that is reliable. DeKooning asserted to someone that every painting of his has something to do with women, but that sounds like braggadocio and smells like a red herring. Whatever. He took the details with him 21 years ago. Never explain! Louse Point is frequently mis-titled by the dainty, the speed-readers and the dyslexic as 'Louise Point', not only for the painting but on some maps I have seen, too. No – 'Louse Point' it is. There are a number of fantasy etymologies for the name Louse Point – well, we can all think up stuff when no evidence need be cited. My own speculation is that the little peninsula on which Louse Point stands looks on a map not unlike a flea in profile – the sort of name that early cartographers liked to dream up. Dream up? The shade of a young man appears out of my past. We are in a dimly-lit living room in Soissons, in the evening. In the yellow light under the standard-lamp the mother is sitting in an armchair, my new love sitting patiently on the floor at her feet, head tilted forwards. Her mother is minutely searching through my love's dark curls for those lucky creatures who enjoy such intimacy with her there. At the dining table her father is demonstrating to me that his Gauloise are much healthier than my Lucky Strike. We each exhale mouthfuls of smoke into a folded handkerchief – the empirical spirit of the l'Encyclopédie made manifest in 1962. My Lucky leaves a dark brown stain, his Gauloise a small yellow patch: C'est un truc! Non, non – c'est vrai. Essaie encore. Over at the lamp the oui of discovery, then that soft crack! Tanned feet with white soles. Oh! – 'Louse Point' is good enough for me! Be gone, shades. Perhaps we should just call such abstract paintings 'titles with paint attached'. Yet there is some way in which this painting is ineffably wonderful – but damn me if I can tell you why.